There was a time when night vision scopes were only accessible to military personnel or law enforcement agents. They were very expensive and technical products that normal people couldn’t buy or use. In today’s world, owning a night vision scope has become considerably easy. If you are a hunter or a target shooter who is out in the field at night, then a night vision scope is what you need. Such a scope enables you to see at night when there is pitch black in your surroundings. These are battery operated devices that are divided into different Generations. Before moving on to considering the factors that play an important role in choosing a night vision scope and then reviewing the top 7 scopes in this category, you to understand how these devices work and what are their common types. Designed for medium range shooting, Sightmark Photon XT is a digital night scope that can be used in both daytime and nighttime. Being a versatile night vision device, it features 6 different types of reticles. For owners of 320, 350, 370 and 400 fps crossbows, two crossbow reticles are offered. For anyone who is planning to use this scope for varmint hunting, 2 duplex reticles are present. For someone who will need this scope for rangefinding, a Mil-Dot reticle is available. Finally, an all-purpose German reticle is there to assist you in increasing your accuracy. It has a fixed magnification power of 4.6x which makes it perfect for medium range shooting. The 42mm objective lens allows for greater light transmission. Its built-in IR Illuminator allows you to see even when it’s pitch black outside. With a high resolution of 38 lines per mm you are able to see crisp and clear images. The LCD display shows you the images and allows you to capture videos as well. Photon XT has glass nylon composite body which makes decreases its weight up to 30%. It has a solid shockproof construction. It has IPX4 rating which makes it a waterproof model. It is not filled with nitrogen and therefore is not a fogproof. It uses 2 AA batteries and can last up to 4 hours with IR. The package comes with additional accessories for mounting, video transferring and cleaning. Pros – Photon XT lets you own the night. It is an easy to install, user-friendly riflescope that is light in weight. The output is quite impressive as well! The scope can shoot birds that are around 100 yards away in pitch black darkness! A reliable name in the world of night vision scopes, ATN raises standards with its X-Sight II Day and Night riflescope. This is not just your regular everyday scope – it has Obsidian Core which is a highly specialized computer that allows you to perform multiple tasks with a blink of an eye. Thanks to Obsidian processor, range finding and windage reading has become simple. The ballistic calculator lets you find the aiming point in no time. Precise ballistics are easily determined for a variety of shots. The Smart Rangefinder removes the guess work and allows you to precisely range your target. You can create multiple profiles for every weapon without worrying to reset the settings the next time you use them. If you wish to record all the steps you took from zooming in on your target to shooting it then set your video record to Recoil Activated Video (RAV) and you will have everything captured. This scope records full 1080p HD videos. It offers green night view, black and white night view and a day view option. It offers silky smooth magnification with a power of 3 – 14 X. For the tech savvy shooters and hunters, X-Sight II has other useful features like gyroscope for image stabilization, E-compass, E-barometer, GPS, Bluetooth and Wi-Fi. It is compatible with both Android and iOS platforms. This is a weather resistant scope which comes with 2 years warranty and other mounting accessories. It runs on 4 AA type batteries and can last up to 12 hours. Pros – X-Sight II is a cult favorite. With advanced features and video recording capabilities, this scope is one of the most useful products available in the market. The image quality is exceptional and its’ day and night vision works just as great! 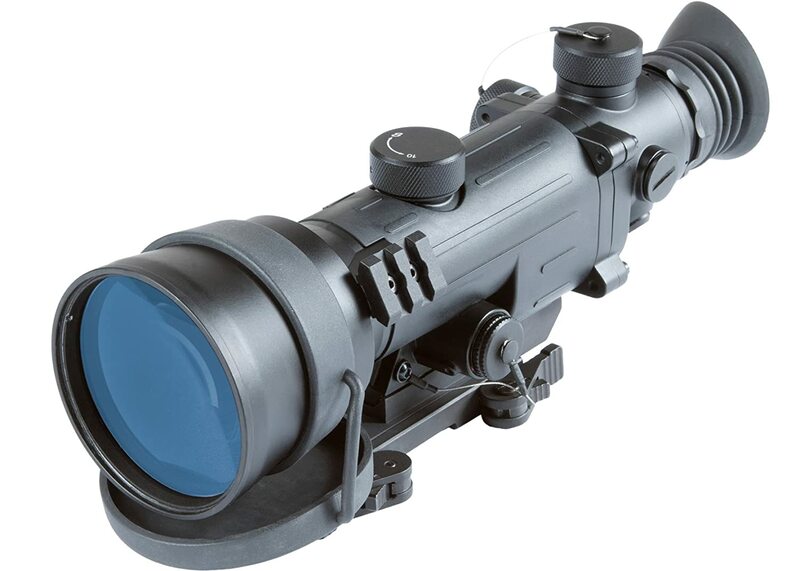 Armasight is known for producing high quality night vision rifle scopes. Nemesis 6X-SD is not different from its other top-quality scopes. It features Gen 2+ standard definition image intensifier tube which offers greater performance as compared to Gen 1 tubes. There is also a detachable IR illuminator fitted in this scope. Unlike any other night vision rifles scope, Nemesis 6x-SD has an illuminated center Red Cross reticle with Auto Bright Control System. Push button controls allow for easy and quick internal windage/elevation adjustments. The 6x magnification range makes it a good medium range scope. You enjoy a high resolution of 45-51 lines per mm. Made from aircraft aluminum, this is a lightweight and sturdy scope. It is also water proof and is backed up with limited two year warranty provided by Armasight. It uses one lithium CR123 battery that last up to 60 hours. The package includes remote control, one battery, packing box, carrying case and a lens cloth. Pros – For the reasonable price, Nemesis6x is a great night vision scope for hunting. It is a great upgrade to the traditional Gen 1 devices. The images offered are crisp and clear. Known as the Varmint Hunter, NVRS Titanium from Yukon is one of their lightest models. It is a Gen 1 night vision rifle scope with built-in pulse IR system infrared illuminator. The adjustable illuminated red on green reticle provides green night view. Its 1.5x magnification power makes it great for hunting the prey down from a short distance. The large 42mm objective lens provides a brighter vision. For enhanced light transmission, the lens is multi-coated. A decent resolution of 36 lines per mm is offered by this riflescope. As the name suggests, NVRS is a made up of Titanium which offers both durability and a light weight. It meets IPX5 rating for water resistance. It operates on two AA batteries. You get a battery life of up to 40 hours. This mini varmint hunter is sold with a remote control, Yukon’s limited lifetime warranty, flip-up lens cover and a carrying case. Pros – NVRS Titanium is an extremely well made product that works flawlessly. The IR illuminator helps in really lighting things up and making the view crystal clear. Firefield NVRS 3×42 is made to hit medium to long range targets with its 3x magnification power. It includes Gen 1 image intensifier tube that comes with a built-in high power IR illuminator. 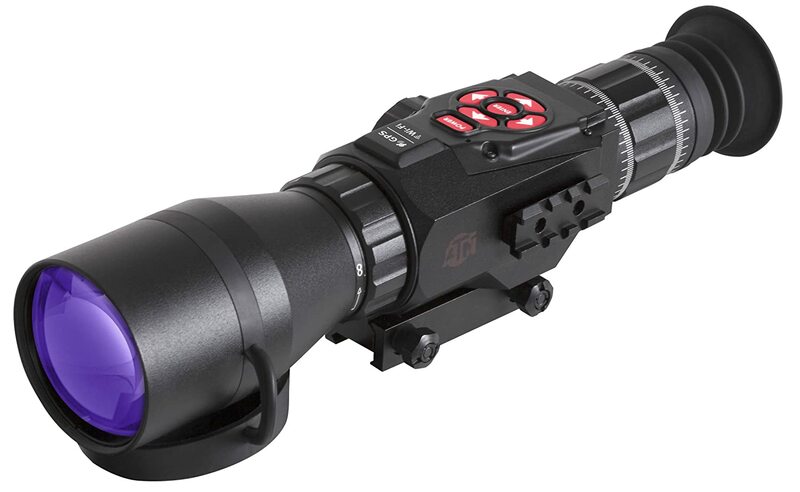 The illuminated red duplex reticle allows you to quickly focus your target. For greater light transmission, it has an objective lens with a diameter of 42mm. Its multi-coated optics and incremental brightness adjustment lets you to quickly adjust in your surroundings. NVRS has a rugged titanium body that withstands impact. It has an ergonomic design which offers a better control of the riflescope. It also withstands harsh weather conditions thank to its weather resistant design. It is powered by 2 lithium batteries and can last up to 20 hours with IR illuminator turned on. Pros – This riflescope has a clear reticle which offers crisp sightings. It is definitely durable and a user-friendly product. Ideal for hunters and tactical marksmen, Armasight Vampire is a high-performing night vision rifle scope. It comes with Armasight’s very own CORE (Ceramic Optical Ruggedized Engine) image intensifier tube. This tube makes it better than most Gen 1 devices and brings its performance at par with Gen 2 night vision scopes. A high resolution of 60-70 lines per mm is achieved by Vampire. It features a red on green reticle with a detachable IR illuminator. 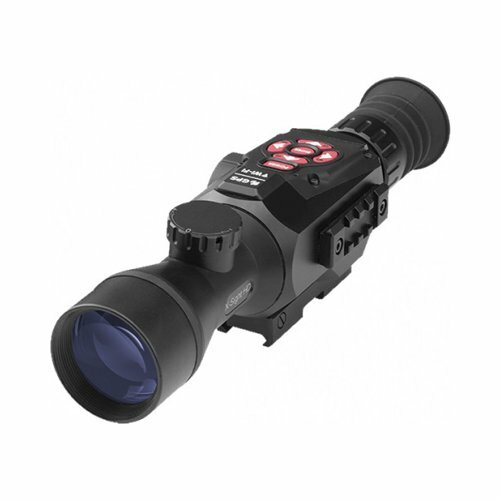 The scope includes all-glass IR transmission multicoated optics for enhanced brightness. This riflescope is purged with nitrogen and sealed with O-rings in order to make water proof as well as fog proof. For greater durability, it is also made dust and sand proof. With a shock proof aluminum body, Vampire is all set to give you unmatched durability. It uses 1 CR123 lithium battery that lasts up to 40 hours. It is sold with batteries, a carrying case, accessories for mounting and a 2 year warranty provided by Armasight. Pros – Vampire outperforms other similar Gen 1 and Digital Generation devices. From Dusk till Dawn, this scope offers great clarity and a spectacular field of view. 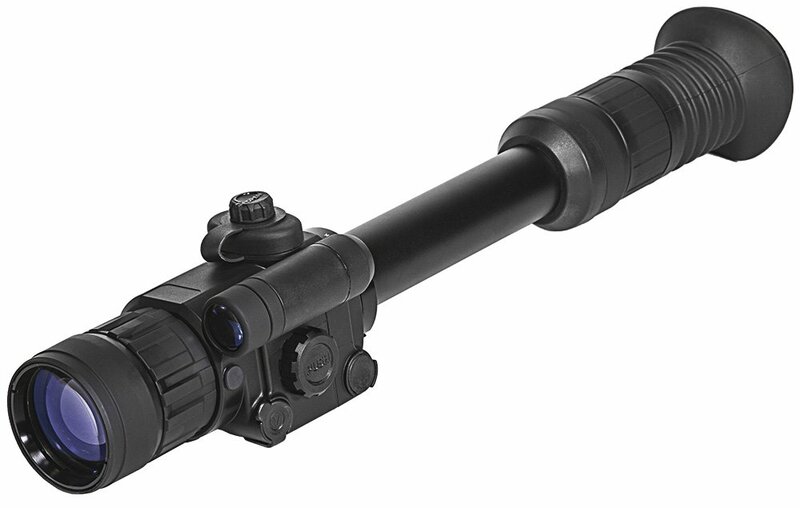 Just like ATN X-Sight II riflescope, X-Sight HD 5-18x features ATN’s highly advanced Obsidian Core processor. With abilities similar to that of a computer, this device becomes a smart riflescope. It has a day and night system which makes it useful for both day and night vision. It has an IR illuminator which has a useful range of up to 100 yards. With a 5-18X smooth zoom, moving in and out of your target is quite easy. You have the ability to record full 1080p HD videos on this scope. X-Sight has an ergonomical design which makes this a user-friendly product. It comes with a gyroscope that enhances image stability and a GPS for navigation at night. Other features include Wi-Fi, Geotag and an E-Compass. It is a sturdy scope with water resistance. 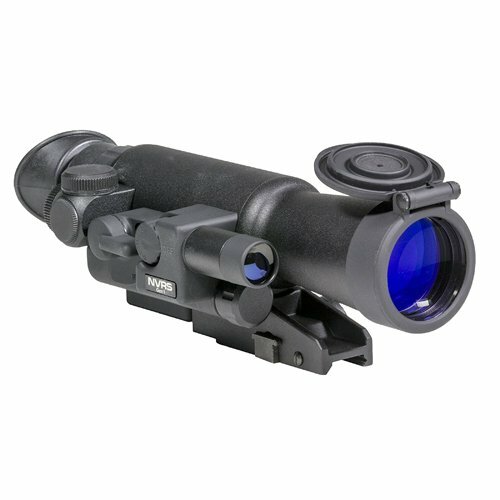 Pros – This scope has amazing clarity and a very comfortable to it. It is the best digital scope given its affordable price! Night vision technology allows you to see at night. It either uses Thermal Imaging technology or Image Intensification in order to make vision at night possible. Thermal Imaging Technology, as the name suggests, uses heat differences in order to detect hot objects. These objects usually appear as red blobs and you are unable to recognize your target. Due to these reasons, image intensification is preferred over thermal technology. Under this technique, the available light is amplified which results in clear and bright images. What happens is that that the light that is present in the surrounding is gathered and passed through the objective lens. This light then hits a gallium arsenide photocathode tube which converts photons from this light into electrons. These electrons then transform into visible light. The process of conversion of electrons to visible light is different in all the three night vision generations. These Generations are explained below. Night vision devices are generally divided into three main Generations – Generation 1, Generation 2 and Generation 3. These three are commonly available in the market and are referred to as Gen 1, Gen 2 & Gen 3. Introduced in early 60s, Gen 1 is the most basic and widely available night vision generation. It fulfills most of your hunting and shooting needs. All Gen 1 devices have built in IR illuminators which project infrared light. This light cannot be detected by human eye but it can be seen in the night vision device. These infrared illuminators are always on. Night vision devices with Gen 1 technology are also fairly inexpensive. Being simplistic and affordable, it has its drawbacks as well. On average, you enjoy around 75 yards of useful night vision. Anything greater than that and your night vision device become useless. The battery life on these devices is very limited as well. You can yield a maximum of 1500 hours of usage out of Gen 1 night vision devices. Because this scope gets illuminated, you are unable to camouflage. Your hiding position becomes visible and you need to switch places quickly. Finally, being inexpensive, most of the Gen 1 night vision devices have low quality optics which offer low resolution and more blurry images. A major upgrade to the Gen 1 devices, Generation 2 night vision technology is set to step up your game by a big margin. Generation 2 devices use microchannel plates that convert electrons to visible light. These plates are the main source of light amplification on these devices. You can see objects as far as 200 yards with your Gen 2 device. This is a lot farther than the useful range offered by Gen 1 devices. As the Infrared on these scopes is not illuminated, Gen 2 technology offers an amazingly long battery life. Some devices can offer up to 4500 hours of battery life. The images you see on a Gen 2 device a much brighter, clearer and less distorted. Unfortunately, these devices are quite expensive as compared to their ancestors. Mostly used by military and special forces, Gen 3 is the real deal. It has further classifications like the 3P and the 3AG. Outstanding performance is common in all the different types of Gen 3 night vision devices. It is the best in every way possible. From the construction to the brightness, everything is top-notch. Cleanest images with the best resolution are offered by Gen 3. Electrons are converted to visible light using microchannel plates that are present in Gen 3 devices. These plates are covered with ion barriers which greatly boosts light amplification. Even in lowlight, the performance is exceptional. A useful range of more than 300 yards can be achieved by a Gen 3 night vision scope. More than 10,000 hours of battery life can be expected from this technology. With these great features you have to pay a price that is up there. According to some people, there is a Gen 4 Night Vision Technology as well. But this technology is strictly restricted by the US Army. Many riflescopes come with day and night systems that are meant to work in both daytime and night time. You usually have a regular daylight scope which has a day/night system attached to it. The magnification and objective lens from the normal scope combines with this system to give bright and clear images. Keep in mind that these systems are very compact and therefore don’t gather as much light as a night scope does. These systems are more suitable for people who own one rifle only and they tend to go out for hunting/shooting in daytime as well as at night. Scopes with digital night vision gather the available light and instead of transforming it into electrons it converts this light intro signals. These signals are then displayed on a screen. The mechanism on these devices mimics that found on cameras. The abilities of a digital night vision device are very close to a Gen 1 and a Gen 1+ night vision scope. You can even take photos and record videos with this scope. Now that you know the different Night Vision types and Generations, let’s move on to the things you should look for while purchasing a night vision scope. Because you not only want to see through your night vision scope device, clarity is one of the important features to look for in a night scope. Hitting a target requires great clarity which can only be achieved if the resolution of your scope is reasonable. Clarity is high when the resolution is high. In order to measure resolution, lines per millimeter are used. The more lines per millimeter you see through your scope, the better the image is. You are also unable to achieve clarity if the images that your night vision scope provides are distorted. Distortion is associated with the quality of lens used. Low quality cheaply made lens tend to distort images. Always go for genuinely made glass lens that are manufactured by known brands. Most Gen 1 devices and some other night vision scopes come with built-in infrared illuminators. These illuminators have their advantages as well as their drawbacks. A night vision scope with built-in IR illuminator is useful for someone who has to hunt in pitch black areas and that too in a very short range. These illuminators also tend to reduce the overall battery life of the night vision scope. For someone who is involved in tactical shooting and has to travel a lot, a night vision scope with a built-in IR illuminator is not a good option. These illuminators also increase the overall weight of your scope and are therefore not suitable for people who need to change their positions quickly. The total range provided on a certain night vision scope is very different from what you actually get. There are two types of ranges – detection and a recognition range. As the name suggest, detection range allows you to detect something. It will make you aware of the fact that there is some moving object in this range. But it will not necessarily tell what it is. This is where recognition range comes in. It tells you what you are actually looking at. It lets you recognize whether the moving target is a deer or a coyote. Recognition range differs with the surrounding light conditions. For a full moon you will have a different recognition range as compared to being under starlight only. Where can you find the recognition range? These ranges are provided by sellers for multiple light conditions. You will notice that the recognition range decreases as the light conditions get worst. 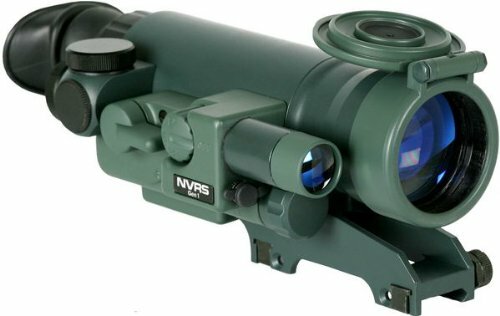 A night vision scope is made up of very small parts including electronic tubes and glass optics that are prone to getting damaged. If you are investing thousands of dollars in your scope you would want to buy one that is the most durable and long-lasting. It should withstand recoil as well as other harsh weather conditions. Before purchasing a certain night vision scope, make sure that the scope you are buying is sturdy. This concludes our buying guide, now we move onto looking at the 8 best night vision scopes that are currently available in the market. To sum it all up, a night vision scope is manufactured in order to let you hit at night when there is low light (in some cases no light at all). In order to get the most out of your night vision scope, you should look for features like, clarity, effective range, durability, magnification and the battery life. Finally, we would like to emphasize on the fact that you should not shy away from spending more money on a powerful and effective night vision scope. Our top 7 best night vision scopes come with all of these features and are set to make your life much easier!